If you’ve ever been to Oahu’s North Shore, then you know just how beautiful and amazing it can be. The great efforts of hundreds of volunteers go into keeping this land beautiful for all to enjoy. Today I (@VBrown) had the opportunity to volunteer some time in support of the continued Keep America Beautiful “Great American Coastal Clean Up” campaign, which is coordinated by Adopt a Beach Hawaii, Sea Turtles International, and Save a Life. We conducted the cleanup in a joint effort representing the U.S. Navy in the tradition of giving back to the community in which we live and serve. It was a great day out and one worth while at that. During our cleanup today, the majority of the trash we found was cigarette butts, bottle caps, glass, and trash from fast food restaurants. This is a matter that we as global citizens can help to reduce through education, awareness, and actively identifying trash during our visits to these wonderful places. One person alone can’t do it all, but together we can make a difference in keeping our beaches clean. Below is a small sample of trash items and the amount that 218 volunteers collected from 5 beaches over 7 events on Oahu’s North Shore during the 3rd Annual Keep America Beautiful “Great American Coastal Clean Up” which took place from March 1 to May 31, 2009 (THREE MONTHS). 15,476 Pounds of litter disposed of. 53,221 Cigarettes & Butts “painfully” picked up! 9,339 Items picked up relating to recreational beach activities and visitors. 1,408 Bottle caps and lids. 1,440 Pieces of broken glass. 96 Pounds of lead weights found under water. In keeping with KAB guidelines, numbers were calculated using a system where a recorder writes down the trash item discovered when it is being picked up. Records are maintained for scientific data and participating volunteer rosters and all records are archived for future study. Years of records are on file to date. 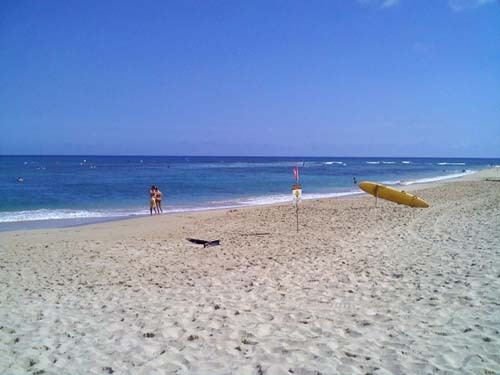 Chun’s Reef, North Shore Beach Clean Ups are the last Saturday of every month @ Noon! Hawaii is known world round for it’s modest weather, aloha spirit and epic surf. Many surfers think of Oahu, Kauai, and Maui as a great place to visit and catch some sets. There’s no doubt that each of these islands hold their own when it comes to surfing, but there is another fun and welcoming place to paddle out on the Big Island’s east-side. Isaac Hale Beach Park is known to locals as Pohoiki and is located at the edge of Pohoiki Bay, in the Puna district of the Big Island. A place once notorious for a rough crowd and unfriendly surf scene, has blossomed into a great family beach park built for the people. You won’t find a white sand beach along this volcanic reef edging the bay, but you will find 9 breaks to choose from. The waves continue year-round, and though sometimes small, You can drop-in almost every day of the year. When the swell hits look out! Experts only at this point. You’ll find a spot to surf no matter what your skill level is. Beginners go to First Bay and hard-core surfers love Bowls on a good day. The boat ramp is full of laughing children and families who are occasionally removed for a boat coming or going. There is a mini pool to the side of the boat dock that has a rock wall barrier, ideal for the babies. There is also a small hot pond nestled in the trees. You’ll find most the amenities you need in the newly built park. There are new restrooms, several showers, and a nice camping lawn. Permit is required to camp. The street, once lined with tarp houses and beer cans, is now a smooth sidewalk traveled by loads of skate boarders. The weekends bring food and ice cream vendors. This is “The” spot to kickback, catch some waves or BBQ some grinds. There are a few things to remember when visiting Pohoiki. As with any place in Hawaii, please respect the people and the land. Drive slow, there are a lot of children skating in the road. Throw your rubbish and recycling in the bins, and most of all, play hard and enjoy your stay!